The latest version of OpenWrt is quite bulky. Although it feats neatly within TL-MR3020's 4MB flash, doesn't leave enough space to install the modules required to shift the root file system to an external drive. and a USB hub with a flash drive in one of its slots. In previous versions of OpenWRT, you had 840KB of space left on internal 4MB flash to install the essential kernel modules for usb, usb mass storage and ext4 which are all essential for mounting USB flash drive. My Weather Station used TL-MR3020 flashed with OpenWrt 12.09 and used this methods. Open up your TL-MR3020 and solder in a USB-UART (FT232RL) board to gain access to its serial port. Issue commands to TL-MR3020 using PuTTY over Serial and configure it to connect to your WiFi router as client. Issue commands to TL-MR3020 using PuTTY (over serial or over WiFi) and configure it to mount external USB flash drive as rootfs. Issue commands to TL-MR3020 using PuTTY (over serial or over WiFi) and configure it to install LuCI and other essential modules that had been left behind when you compiled the image for OpenWrt. Done. Now you can access your router using your browser as well. Note the location of RX, TX and GND. RX on TL-MR3020 to TX on FT232RL. Install the OpenWrt toolchain on your 64-bit Ubuntu laptop. Instructions to do this are in my blog post here. The blog post covers how to install toolchain for Attitude Adjustment - a previous version of OpenWrt. In the current case we need to perform this process for the latest version - Chaos Calmer. So please replace all the URLs that point to tools for Attitude Adjustment to that of Chaos Calmer. The respective URLs for Chaos Calmer are at the end of the blog post. make image PROFILE=TLMR3020 PACKAGES="blkid block-mount kmod-fs-ext4 kmod-usb2 kmod-usb-uhci kmod-usb-ohci kmod-usb-storage"
Disconnect the ethernet cable and connect to your router using a USB cable from your laptop to FT232RL board that you soldered to your TL-MR3020. Now use PuTTY or minicom to gain access to console on your router. Look here on how to configure your router to connect to your home WiFi as a client. to know the path. In my case this was /dev/sdb1. In your case it could be /dev/sda1. Use this path in the following steps wherever required. After editing the file press Escape on your keyboard followed by colon (:) and then type "wq!" and press Enter to save the file. This will install LuCI the web interface as well as few other useful utilities for your IoT projects. Configure whatever your TL-MR3020's settings to whatever you want to. Thanks for the compliments! 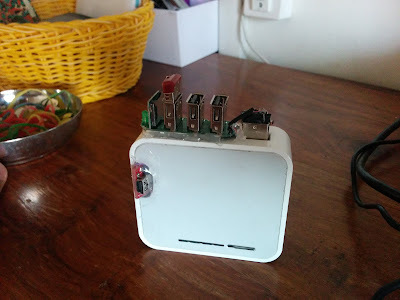 Alos, many thanks for the update as well, I have been playing around and blogging about OpenWrt for quite sometime now. I always used to wonder if developers/hobbyist found my blog useful. Comments and updates from readers like you help keep me motivated to keep blogging about what I do. Thank you again. make image PROFILE=tl-mr3020-v1 PACKAGES="blkid block-mount kmod-fs-ext4 kmod-usb2 kmod-usb-uhci kmod-usb-ohci kmod-usb-storage"